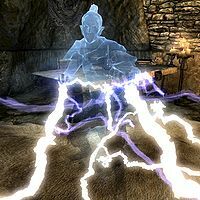 Wyndelius Gatharian is a Dunmer bandit wizard inhabiting Shroud Hearth Barrow in search of the Sapphire Dragon Claw to gain access to Shroud Hearth Depths. He appears spectral when encountered, which is later revealed to be due to a potion he consumes. He is hostile to the player and, upon killing him, one can read his journal. The journal explains why he is pretending to be a ghost; to make sure the locals at Ivarstead would not interrupt him in his search for the claw. Over time, his mind started to break down and by the time the player finds him, Wyndelius is of the belief that it is his destiny to guard the barrow. Wyndelius seems to react differently if raised as a dead thrall. When revived, he will go to ghost form (possibly scripted) and will speak normally with no moaning or groaning, saying things such as "Hmm? Does someone live among the dead?" when enemies are around or "Finality." when an enemy is defeated. As such, for anyone who refrains from using dead thrall/reanimate due to the moaning, this makes him a prime candidate for reanimation (other NPCs will still treat him like any other zombie though). Wyndelius is immune to "bleeding damage" even though he isn't really a ghost. In the Shivering Isles DLC in Oblivion, there is a Dunmer named Syndelius Gatharian. Syndelius and Wyndelius share race and surname, however it is unknown if they are related. This page was last modified on 8 February 2016, at 11:55.